The perfect high-end lithium battery for the Cruise. Or for your on-board power supply. Choosing lithium means choosing high performance. Choosing the Power 26-104, also means choosing an unrivalled level of professional safety. The Power 26-104 is equipped with a comprehensive safety system combining the requirement for general operating safety with safety in maritime use. 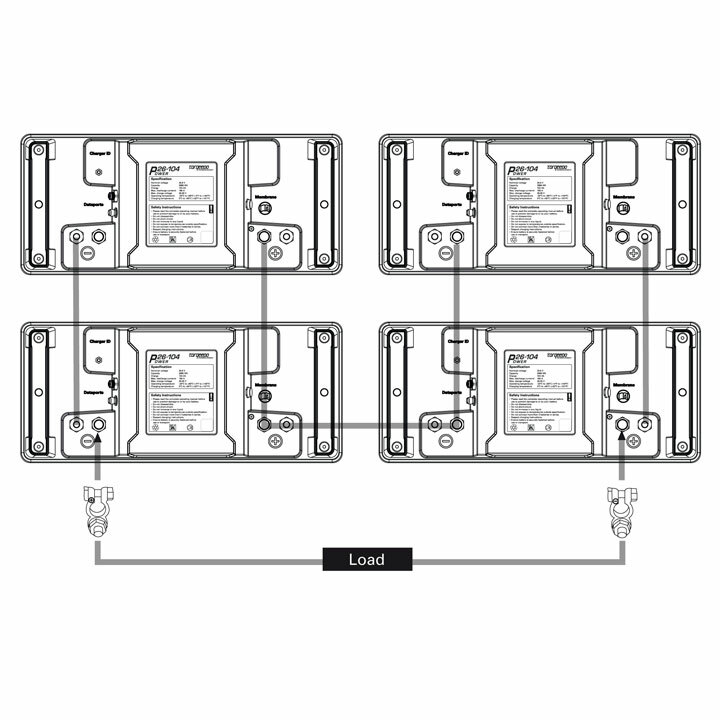 Thanks to plug&play, the Power 26-104 can be installed and activated in a few short steps. And with a 5-stage safety concept it is arguably the safest battery of its kind for boats. Its long life expectancy and low capacity losses are convincing. Up to 70% less battery weight than AGM or gel batteries. Maximum safety thanks to 5-tier safety system, including battery management system with one-fault safety. Identifies the battery and communicates with the Cruise on-board computer. plug the cable in, “electronic handshake”, finished. recognises when the battery is submerged and automatically switches the voltage off at the poles. Prevents the potential formation of electrolytic gas in the event that water gets into the boat. balances differences in temperature and pressure without limiting waterproof qualities. the individual battery cells consist of welded steel cylinders each of which is equipped with several hardware safety mechanisms. top quality, exclusively from fully automated Japanese production. the BMS provides additional protective and balancing functions for long battery life. All safety functions have redundant backup thanks to one-defect safety. What type of appliance can I use the Power 26-104 with? In principle any 24 V appliance that you otherwise operate on board, or 12 V, 110 V and 230 V appliances with a voltage converter. What is the life expectancy of the Power 26-104? The life expectancy of a lithium battery depends on calendar age and cycle lifetime. In recreational use the cycle lifetime hardly plays a role since a relevant number of cycles (over 500) is usually never even almost achieved. In contrast, calendar ageing plays a significant role. Lithium batteries begin to age from the moment they are manufactured. This ageing process is accelerated the more/more frequently the battery is exposed to high temperature. Lithium batteries may also be used at high temperatures, but they should be stored in a cool place as often as possible. The annual capacity loss over time is approx. 4% (at 25 °C ambient temperature). I rarely use my battery and store it for long periods. Will this damage a Power 26-104? The new Power 26-104 models (2015) have an automatic deactivation mode. The battery's electronics will be switched off 48 hours after the last use and the battery will be put into deep-sleep mode. The battery can remain in this mode for up to a year provided it is charged to at least 30% of capacity. Even so, a check should be made on the battery's charge status every two months when stored for long periods. The battery should be quickly recharged after every deep discharge. Discharging a battery fully and then storing it for a long time (without charging it) should be avoided at all costs since that damages any type of battery. How long does the Power 26-104 take to fully charge? Charging takes approx. 11 hours using the charger supplied (from complete discharge, i.e. 100% depth of discharge). 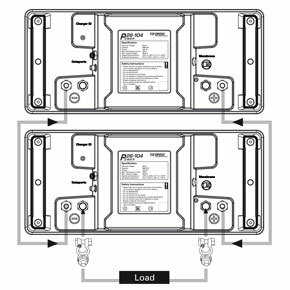 Why does the Power 26-104 have a discharge limit? One of the advantages of lithium batteries is that they can supply very high currents. The disadvantage of this is that lithium batteries can cause considerable damage in the event of a short circuit – unless such high short-circuit currents can be avoided. This is an important safety function of the Power 26-104 and is part of the BMS. 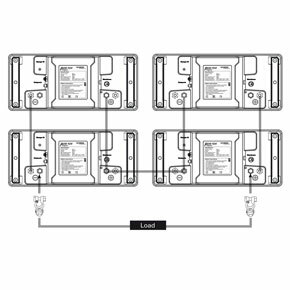 If higher discharge limits are required, several batteries can be connected in parallel, which multiplies the discharge limit. Can I connect several Power batteries together to form a battery bank? Yes, that is possible. The integrated battery electronics recognise and classify the batteries. What is the warranty on the Power 26-104? As with all our products, we give a 2-year warranty from the date of purchase for non-commercial use. 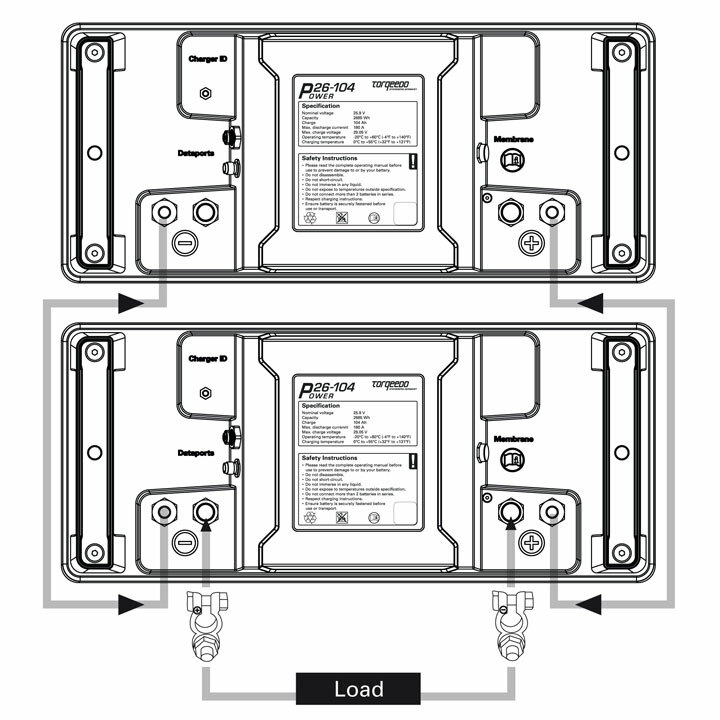 Is the Power 26-104 suitable for the installation of battery banks? 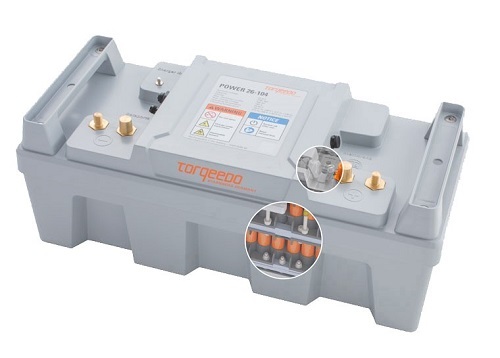 The Power 26-104 is ideal for the installation of battery banks. You can choose between a serial or parallel connection. Please make sure to read the operating instruction for more details. 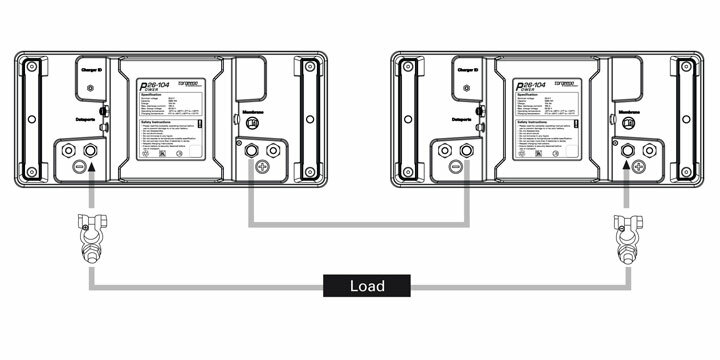 Two Power 26-104s can be wired in series by connecting the positive pole of one battery with the negative pole of the other . The consumer appliance is then connected to the positive pole of the first battery and the negative pole of the second. The figure shows how 2 batteries have been wired together in series (2S1P connection). Several pairs of serially wired batteries can be connected with each other in parallel (2S2P connection) in order to increase the capacity of the battery supply. Up to 8 pairs of serially wired batteries can be connected in parallel in this way.